Gillian Flynn has an amazing talent for creating deplorable characters that you can’t wait to learn more about. It’s really a remarkable gift, the way she pens unreliable, insufferable, repulsive people, yet makes them so fascinating, you’re sad when their stories come to a close. That’s not to say that all of Sharp Object‘s characters are horrendous; there were a few people within the pages of this novel who allowed me to retain my faith in humanity. I can’t say more about them, though, because to do so would be to ruin the experience for you. Tell me: What’s the last non-YA book you read and loved? All you had to say was hog farm. If you’ve ever been near one, you know the meaning of disturbed. My last adult read was SEED, by Rob Ziegler. I have never been anywhere near a hog farm, Matt, but the way the one in SHARP OBJECTS was described made me sick to my stomach. Hard to believe such places exist and are acceptable. Yikes! That hog farm scene still haunts me. I didn’t eat pork for months after that. Uh, yeah. I can’t imagine seeing such a place and then wanting to go back there time and again, like Amma. Ugh… This book! The history of rabies does seem like a weirdly interesting topic, Jennifer. If you decide to pick up an adult novel anytime soon, I definitely recommend Gillian Flynn’s work. I definitely need to read this! I don’t think I’m too easily disturbed. I love Criminal Minds and I feel the same way about saying that as you do about saying you like this book–it feels wrong to say I enjoy it. I loved Gone Girl. It was so unpredictable and suspenseful and just crazy. I promised my sister I’d read Insurgent next (after Just One Day) but I think I will read Sharp Objects after that. The last non-YA book that I read was ONCE MORE WITH FEELING by Megan Crane. I really enjoyed it! This is timely because the last adult book I read was Gillian Flynn’s DARK PLACES. 🙂 I enjoyed it, though SHARP OBJECTS sounds a lot creepier. DARK PLACES was more of a mystery, with some intense moments but not as crazy as this book, it seems. 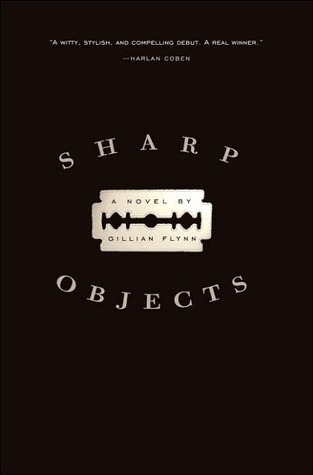 Anyway, since I also loved GONE GIRL, I’m going to round out my Gillian Flynn reading and pick up SHARP OBJECTS soon! You’ll have to let me know what you think, Ghenet. I’m really looking forward to starting DARK PLACES. I love a good mystery! I liked GONE GIRL slightly better than SHARP OBJECTS, so I fully support that decision. Please let me know what you think once you’ve read! You know I loved (understatement) GONE GIRL, but I do sometimes get disturbed easily . . . still, I want to at least try this one! If it’s too much for me, I’ll pick up DARK PLACES. Sounds like a plan. Yeah… SHARP OBJECTS really messed with me. A few nights I dreamt about it and woke up with a sore jaw from grinding my teeth. Yikes! Wow. This sounds like a really good story. I’ll have to check it out. Thanks for sharing. First, how do you read on the Elliptical? I have tried. And failed. Several times. Also, this book is highly intriguing. I am going to have to check it out! Thanks for the rec, Katy! It is a challenge to read on the elliptical. I find that if I crack the spine of the book I’m reading (I know, I know!) it’s a little easier. Also, the typeface can’t be too small. 🙂 Let me know if you read SHARP OBJECTS. I think you’d definitely be entertained!